The off-season is approaching for many of us. This is a good time for re-evaluating this year’s achievements and mishaps, taking a temporary break from racing, and relieving the pressure of training performance. But a break doesn’t mean rest. Rather, it is a strategic downtime with adjusted training that sets us up for the upcoming race season. In this article, you’ll learn how to go about it. Serious runners like you and me differ in many ways from the casual runner. One of them is running year-round, without excuses, even when there are no running races at sight. The pursuit of running excellence requires long-term thinking. While the intensity and duration of our workouts may vary throughout the season the basic routine stays in place. That is not to say you don’t deserve a break from the rigors of competitive training. A temporarily reduced training load ensures optimal mental and physical recovery. This can be as short as 1 month, or up to 4 months for those who live in cold climates (or extremely hot ones). Elite athletes do have scheduled ‘breaks’, and so should you. Two steps forward, one step back. Of course, we running addicts need our ‘daily dose’ of running training to function optimally. All race performance goals aside, we have become dependent on the full scope of benefits of running such as enjoying large meals without retribution, the runner’s high, and the generally increased well-being. For those reasons alone we need to continue the basic workouts of running training. If done right, you’ll keep most hard-earned adaptations. Sure, you won’t be able to maintain race-specific fitness which requires a high lactate threshold for all long-distance races. But that’s ok. The LT can be developed rather quickly when it becomes necessary. Rather, you will need to keep your aerobic base intact and maintain the muscular strength and power for top-end speed. 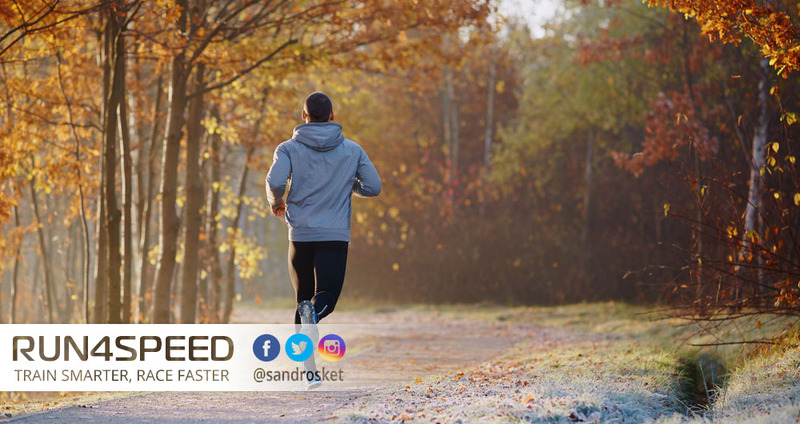 A drop in running mileage by about 25% for 3 to 4 months is enough to give your muscles, tendons, ligaments, and joints the chance to repair themselves. However, if you prefer a shorter time-out of 1 to 2 months I’d recommend cutting down mileage more drastically to about 50%. Having said that, it is important to maintain top-end speed by doing a few strides during or after easy runs. As far as moderate intensities are concerned, I strongly advise omitting VO2max intervals, threshold runs, and high-end aerobic runs during the off-season. Your endocrine system requires a break, too. After all, it supplies all the necessary hormones for training and repair. Many athletes suffer from adrenal exhaustion due to the combined stress of training, work and family commitments. But there is also an opportunity here to up the ante for strength training, which often has to give way to the more important running sessions during the in-season. I recommend a gym membership with the supervision of qualified trainers. As with running, you’ll get the most out of training with a systematic approach. The more running-specific the exercises, the better. Cross-training, too, is a great alternative to running. The most running-specific form of CT for endurance is cycling for 2 reasons: It recruits a similar set of muscle groups and its demands on the aerobic system are almost as high as running itself. Aim for a high cadence to ingrain the neuromuscular patterns for speed. Avoid the elliptical unless you really have no other choice. In summary: The off-season is not a break from training. We dedicated runners will need a certain amount of training to maintain a relatively high fitness level year-round. This can be achieved with polarized training (cutting out middle paces but keeping general endurance and top-end speed). Much of running to be substituted with a combination of strength training and cross-training.